Druva Inc., a cloud data protection and management company, recently announced updates to its Druva CloudRanger and data protection solution for AWS Workloads, which includes the industry's first advanced automated disaster recovery, legal-hold, and file level search. All these features are part of the Druva Cloud Platform and are supposed to help enable businesses to utilize the AWS cloud environments against data lifecycle as well as rapidly plan a response to legal data inquiries. Whenever we talk about disaster recovery, the traditional model includes a high level of complexity, testing, administration and cost which ensure that business-critical applications run without any kind of interruptions. 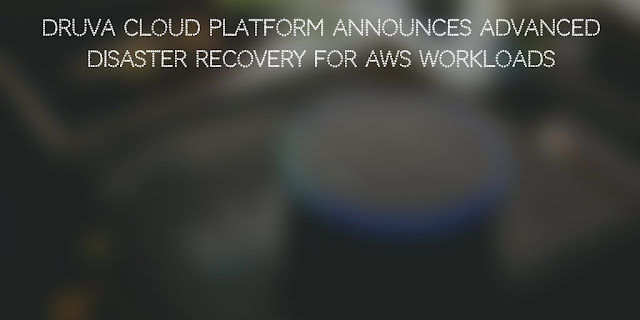 Druva's new disaster recovery system enables organizations to easily replicate and clone the whole AWS account across regions. It also helps create recovery plans in a way which will prove to be cost-effective and efficient at the same time. This will directly translate to enhanced productivity. Druva CloudRanger fule search will help organizations scour through 100s and 1000s of TBs of data through all of the companies AWS accounts, as well as perform a search in snapshots. This will probably be useful whenever a case of compliance and enforcing retention comes into play. Organizations which work with specific compliance requirements, for example, GDPR, now have the option to easily search through thousands of snapshots which help save them a vast amount of time and take effective actions. It also helps automate the identification, collection, and preservation of targeted data across various cloud workloads, all while maintaining integrity and chain of custody throughout the legal process. Druva CloudRanger automated disaster recovery is available to everyone as we speak, while CloudRanger legal hold and file level search are currently available to early access customers with a planned public availability in Q1 2019.